"Tank and the Zydeco Codebreakers". Tank's band sounded very good which goes to show you just how much talent runs along the i10 corridor all the way from Lafayette Louisiana to Houston Texas. Amede Ardoin is considered the father of today's Cajun and Zydeco music and back in the 40's he had a tragic end to his life. There has been an ongoing search for where he was buried and from this new article it appears the search will continue! 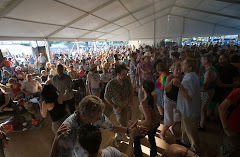 Thanks to the endless hours of road trips the younger generation is keeping Zydeco alive and taking the time to travel to festivals away from Louisiana and Texas to spread their talents. The video clip below is to the recent Long Beach Crawfish Festival which just happened the first week in August, 2013. The video clip is Ruben Moreno and his band pumping out one of Brian Jacks famous tunes from a few years back. Ironically there are a few less dancers at some of the California festivals compared to 10 years ago but we actually have more festivals. We only had three main Southern California festivals in the past but the Long Beach Crawfish festival each year has been bringing out more and more high talented Zydeco bands from Louisiana and Texas. The exposure of Zydeco has seemed to have grown over the years. Check out the drummer Steven... this guy is an incredible drummer... a step above many Zydeco drummers.